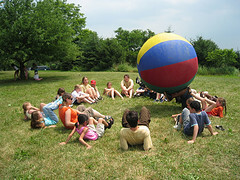 The Day Camp is divided into groups of approximately 8-18 campers each with their own staff and outdoor meeting place. Tracker Guides are 14 & 15 years old and are chosen by nomination and application. We offer a Leadership-in-Training Program for Teens ages 15 and 16.